High quality steel frame with high grade polypropylene shell. Seat height - 430mm (Other height available on request). Overall H x W x D - 746 x 490 x 518mm. Affordable and stackable chairs are useful for events; they allow you to have more a greater quantity of seats for events as they are easier to store. 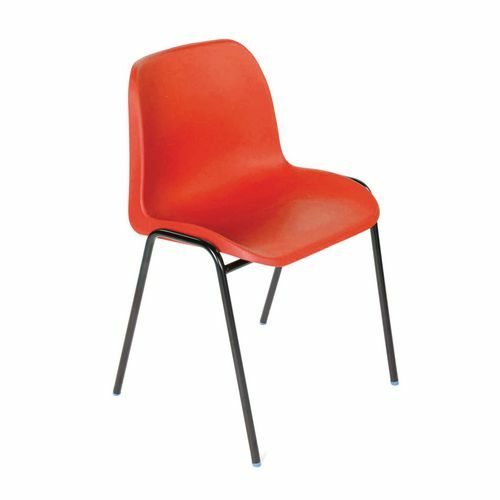 Our polypropylene stacking chairs are ideal for storing, enabling you to maximise your storage space with these traditional stacking chairs. They are tested to EN1729 part 2 and they have a high quality steel frame with high grade polypropylene shell. The seat height is 430mm and the overall dimensions are - H x W x D; 746 x 490 x 518mm. Stackable chairs are convenient as they take less time to set out and put away, because you are able to carry more chairs in one go. They are available in four colours; black, blue, red or lime, allowing you to choose the right colour for your premises and the purpose you will be using them for. Our polypropylene stacking chairs are affordable and will save you space in your storage areas.